Continuing our delve into the lands of Oriental Adventures which began with my reimagining of the korobokuru as nopon for D&D 5e. I was inspired after playing Fire Emblem Fates to re-read all the 1e, 2e and 3e Oriental Adventures material which further stirred me to update some of the races and classes for 5e. I included a dire beast template you can use this as a guide to creating a dire version of a normal animal if none already exist for the Nine-Tails feat. N.B. Most of the text is lifted directly from the 3e Oriental Adventures manual. I modified it to include some original 1e text as well as other areas as needed to make it fit with 5e and my own campaign world. Here is the shape-changing hengeyokai. Hengeyokai are intelligent, shapechanging animals, able to shift freely between human and animal forms, as well as a bipedal, animalistic form. Many animal species exists, defined by the kind of animal form they can assume. They are typically found on the fringes of human-settled lands, where they can mingle in human form but retreat to solitude when they desire. Hengeyokai tend to be secretive, reclusive, and solitary, dwelling alone or in small bands. They often display personality traits similar to their animal type—so monkey hengeyokai are curious and inquisitive, hare hengeyokai are peaceful but easily startled, and so on. Hengeyokai usually do not try to fit into human society, knowing that they are different and believing that they are more closely connected to the spirit world. In animal form, hengeyokai are almost indistinguishable from normal animals except through magic. Naturally, their behaviour often provides proof of their intelligence, so careful observation of a hengeyokai in animal form can reveal that it is not what it appears to be. Hengeyokai can also assume a bipedal, animalistic (“hybrid”) form. They stand on their hind legs (or similar appendages) to the height of their human form. The front paws, wings, or fins change into hands, capable of gripping and using normal equipment. The rest of the body retains the general appearance of the animal, including fur, feathers, wings, tail, and other characteristic features, but in the overall shape of a humanoid head and torso. 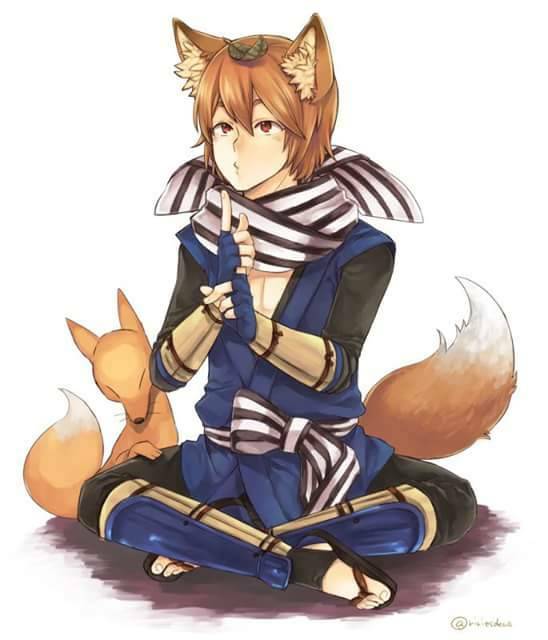 They may also choose to what extent their animalistic features come out in this form – for example, a kitsune (fox hengeyokai) may choose to look completely human but have a fox tail and ears. In human form, hengeyokai look exactly like normal humans, though (like lycanthropes) they often display some feature associated with their animal form. For example, a sparrow hengeyokai might have a sharply pointed nose, while a rat hengeyokai might have beady eyes and a long moustache. Hengeyokai often live near humans, and good hengeyokai sometimes assume a protective role over a nearby community. A hengeyokai never feels a part of a human community, however, even when grateful villagers offer food or gifts to reward the hengeyokai for the protection she offers. Evil hengeyokai instead prey on human communities, and are rewarded with fear and hatred. Hengeyokai believe themselves to be closer to the spirit world than humans, and therefore feel a closer affinity for spirit folk when the two races come into contact. Most hengeyokai are chaotic, with a strong independent streak. They are wild and value freedom—theirs and others’. Some types of hengeyokai strongly favour good or evil: carp, crane, dog, hare, and sparrow hengeyokai are usually good, while badger, fox, raccoon dog, rat, and weasel hengeyokai are usually evil. Hengeyokai do not have lands of their own. They live—alone or in small bands—near human communities, usually on the edge of civilization, near regions of unsettled wilderness. Given their strong chaotic streak, hengeyokai are frequently on the move, particularly when the advance of civilization turns their wilderness retreats into bustling metropolitan areas. Hengeyokai do not worship the spirits that humans venerate—they consider themselves the spirits’ equals. Hengeyokai may practice the disciplines of a philosophical school, sharing a spiritual orientation with certain monks. Hengeyokai shamans command the power of the spirits not through veneration, like human shamans, but through partnership. Hengeyokai names follow human patterns in whatever lands they dwell. Hengeyokai are commonly adventurers, since the sedentary life of a commoner holds little appeal for them. They are usually motivated by little more than wanderlust, or perhaps curiosity about the world. As a hengeyokai, you have the following racial traits. Ability Score Increase. Hengeyokai tend to be flighty and weak-willed but your animal nature will determine your ability bonuses (see Kind below). Size. Hengeyokai are about the same size as humans when in human or hybrid form. Your size is Medium. Darkvision. Your animal heritage grants you the ability to see in dark conditions when in animal or hybrid form. You can see in dim light within 60 feet of you as if it were bright light, and in darkness as if it were dim light. You can’t discern colour in darkness, only shades of gray. Animal Whisperer. You have the supernatural ability to communicate with other animals of your kind. Beastform. This supernatural ability functions like the polymorph spell, but a hengeyokai can change form a number of times per day equal to 1 plus your character level. Thus, a 1st-level hengeyokai can switch from human form to animal form and back again in a single day. On your turn, you can shift as a bonus action. A hengeyokai’s animal form is a normal animal of Small or smaller size. Possible animal forms include badger, carp, cat, crab, crane, dog, fox, hare, monkey, raccoon dog, rat, sparrow, and weasel. Equipment the hengeyokai is wearing or carrying transforms to become part of the animal form (as with polymorph), and magic items cease functioning while the hengeyokai remains in animal form. When in animal form you retain all your ability scores and hit-points and add your proficiency bonus to the base animals AC, to-hit and damage rolls. In animal form, a hengeyokai is effectively disguised as an animal, gaining a +10 bonus on Deception checks while in this form. In hybrid form, you gain one natural attack appropriate for your animal form as well as any relevant traits. For example, an inugami (dog hengeyokai) gains a bite attack and Keen Hearing and Smell using the mastiff as the base animal (you will need to work with your DM for specific abilities but any beast can be an hengeyokai). Also in hybrid form, you can typically wear light or medium armor without modification, but wearing heavy armor is impossible. Equipment worn or carried by a hengeyokai in human form does not transform when the hengeyokai assumes hybrid form. When a hengeyokai in animal form assumes hybrid form, your equipment returns to its normal form and magic items resume functioning. You also gain a feature that depends on your animal species, described under Kind. You may speak in any of these forms and, if applicable, cast spells. Once all usage of this ability is exhausted you must finish a short or long rest before you can change-shape again. Beast form also allows hengeyokai to take the Nine-Tails feat which is exclusive to this race. Shapechanger. Hengeyokai are shapechangers, not humanoids. As such, they are immune to spells that specifically target humanoids (including charm person and hold person), but are susceptible to any spells or effects that target shapechangers. Language. Hengeyokai speak their own language (a form of Sylvan), which is common to all hengeyokai regardless of animal type as well as Common. Art by the wonderful sakimichan.